CAM (IHCAN) "Outstanding Practice Award"
This innovative book gives the reader the tools to plan a more predictable and personalised approach to the management of Parkinson's Disease. It is suitable for Healthcare Professionals, Parkinson's Sufferers, and Caregivers, and clearly explains the effects of nutrition and medication on brain and general metabolism. "This timely volume provides an easily accessible and scientifically referenced source of information on the diverse aspects of drugs and nutrition." "To anyone with or touched by Parkinson's, I commend this book to you. It is an indispensable tool to help you to help yourself. Don't be a nutritional 'neurosceptic' like I was. Read on and reap the benefits!" "In timing the L-dopa as the book says, I feel much better!" "Above all you have given us hope, help and a means to manage this disease." "Your books have been of tremendous help to us." 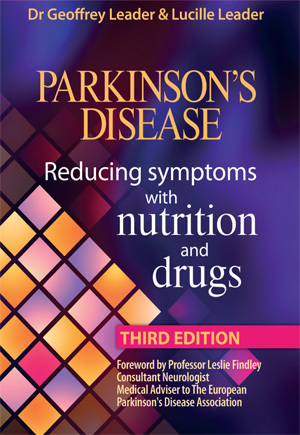 This groundbreaking book offers a powerful blending of nutritional and pharmaceutical benefits, presenting the latest drugs and nutrients in the theraputic approach and management of Parkinson's Disease. In 'user-friendly', easy-to-follow style, it aims to reduce distressing symptoms, improve general functional health and promote well-being in people with Parkinson's disease. It clearly explains the effects of nutrition and medication on the brain and general metabolism, thereby empowering the reader to plan a more predictable and personalised management approach. This inovative book is suitable for Healthcare Proffesionals, Parkinson's Sufferers, and Caregivers alike. It is also appropriate for students of medicine, nutrition and dietetics, presenting underlying biochemistry and scientific references. Smoothing out the "on-off" period. Individualising drug dosage and intervals between administrations using special monitoring charts. Specific nutritional recommendations to improve bowel function, weight control and energy. Biochemical tests to establish deficiencies/excesses at the cellular level. Nutritional supplements and diet for cellular deficiencies or excesses demonstrated. Cooking methods, diet, antioxidants and environmental awareness to reduce harmful free radicals. Simple delicious recipes suitable for L-dopa users to enjoy with family and friends. Solutions for problems of chewing, swallowing and malabsorption. Sleep - practical and nutritional considerations. Stress management and the "dopamine connection" - practical and nutritional considerations. Sexuality - emotional, practical and nutritional considerations. Optimum recovery from surgery - peri-operative nutrition. After antibiotics - restoring intestinal immunity with probiotics.